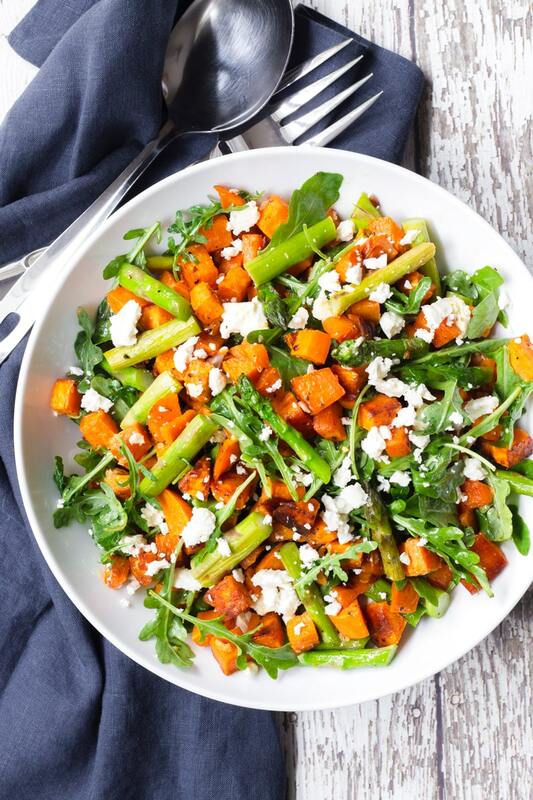 Try this Roasted Asparagus and Sweet Potato Salad! 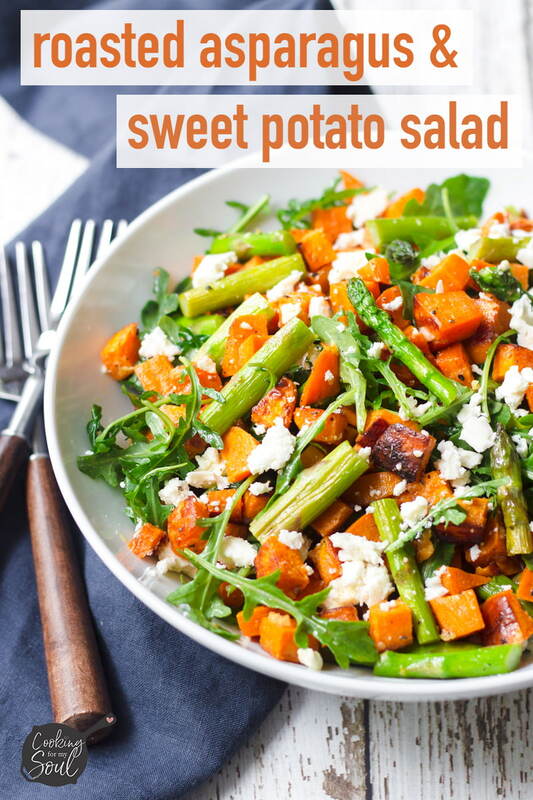 Full of healthy veggies and a delicious sweet garlic vinaigrette. 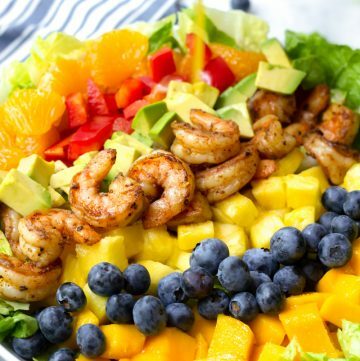 Make this healthy salad for dinner tonight! Guys, this salad is one of the best things I’ve ever eaten. Like, seriously. It’s so fresh and cozy at the same time. 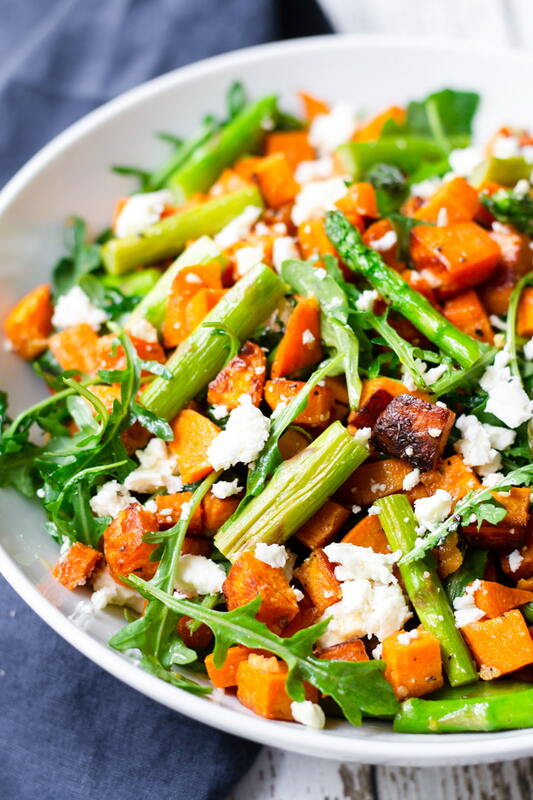 You’ve got the freshness of the arugula and the feta cheese, plus comforting bites of perfectly roasted asparagus and sweet potato. Now, I don’t know if this salad qualifies as a fall salad just because asparagus tends to be a spring vegetable. But, you know what? 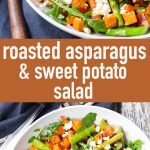 Asparagus tastes great year-round, and these beautiful roasted sweet potatoes make this salad feel and taste like a fall salad. Life is good. Doesn’t that sound heavenly? 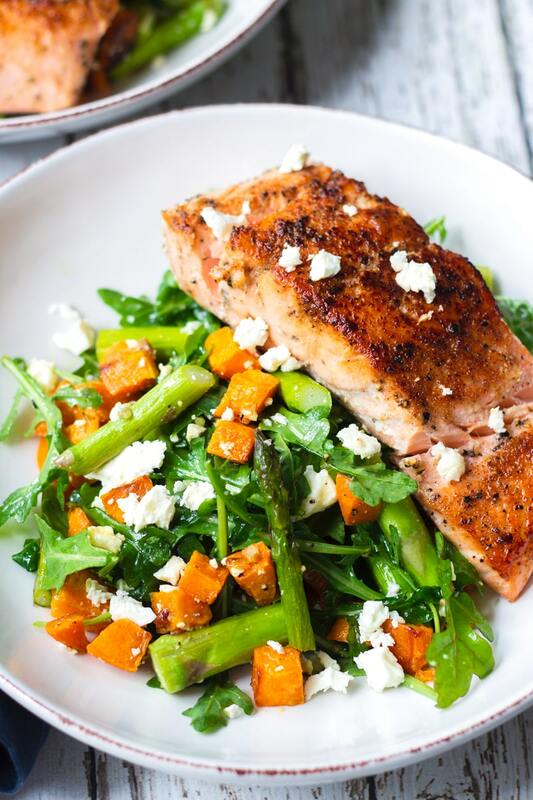 Beautiful and healthy ingredients in a delicious dish. I am so thankful. Roasting always requires high oven temperature. I always go for 400-450 degrees F.
Seasoning is ULTRA important. Be generous with your seasonings. Just remember to keep an eye on it due to the high oven temperature. I like to taste for doneness about 5 minutes before they are supposed to be ready. 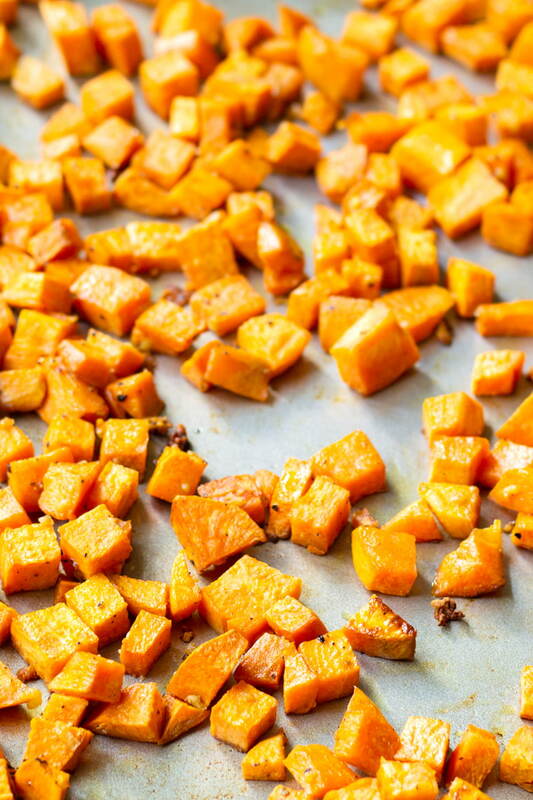 Use a spatula to flip the sweet potatoes halfway through cooking so they brown evenly on all sides. Asparagus cooks really quick. If you want a crunch to each bite, slightly undercook them. Taste them about 5 minutes before they are supposed to be ready. 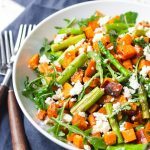 This healthy roasted asparagus and sweet potato salad is packed with delicious vegetables, feta cheese, and a delicious sweet garlic vinaigrette. Make the vinaigrette: Combine all vinaigrette ingredients in a mason jar. Shake well. Set aside. 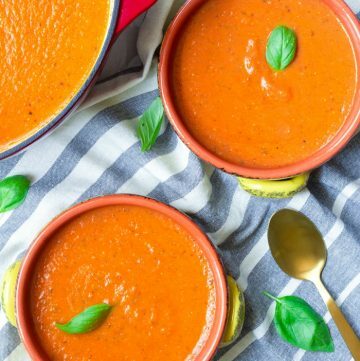 Place sweet potatoes in a large bowl, and add 1/4 cup olive oil, minced garlic, 1 1/2 teaspoons Kosher salt, and 1/4 teaspoon ground black pepper. Toss to combine. 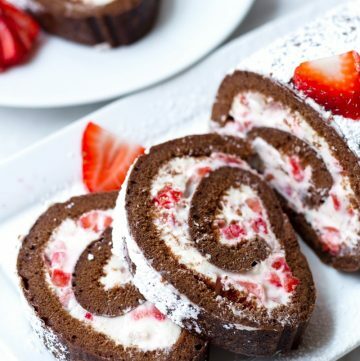 Pour onto a baking tray and roast for about 20-25 minutes, flipping halfway through. Meanwhile, in another baking tray, toss the asparagus with 1 tablespoon of olive oil, 1/2 teaspoon salt, and 1/4 teaspoon ground black pepper. Place asparagus on a baking tray, and roast for 8-10 minutes. Transfer to a plate and carefully cut into 2-inch pieces. In a large salad bowl, toss the arugula with some of the vinaigrette. 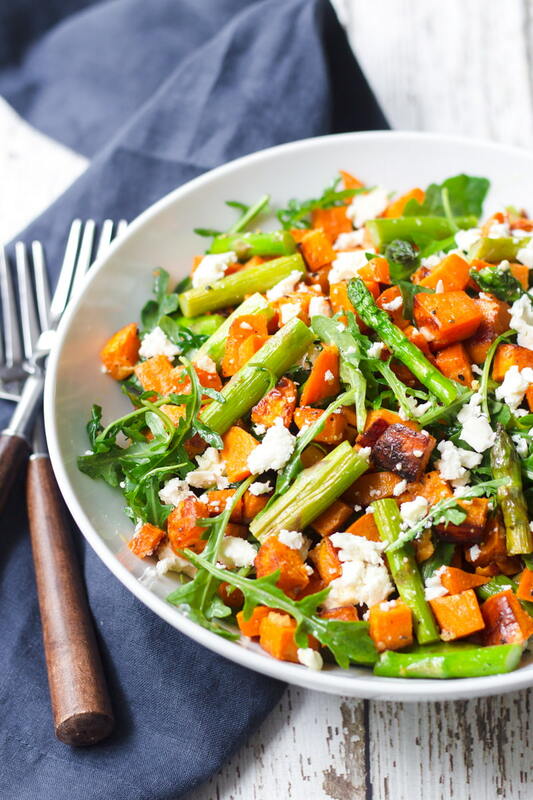 Then add the roasted sweet potatoes, roasted asparagus, and feta. 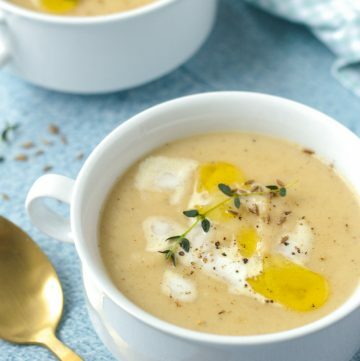 Toss again to combine and drizzle with more vinaigrette. Enjoy!